Taiwan's National Tsing-Hua University has been pursuing blue-light free OLED panels for a long time, developing orange-colored (1,914K) OLED panels which they claim is much healthier than regular OLEDs or LED devices. In November 2014, we reported that Taiwan's PMOLED maker WiseChip Semiconductors licensed technology Tsing-Hua's technology, with an aim to produce such panels by early 2015. This did not happen, but today we hear that the Taiwanese government decided to fund WiseChip development - awarding the company with 10 million NTD (about $300,000 USD) each year for two years - and the Wisechip will be able to start mass producing those 1900K OLEDs. The researchers quote an article published last year that suggests that white LED is linked to breast cancer. White light may case irreversible eye damage, it suppresses melatonin secretion at night and is linked to all sorts of health problems. 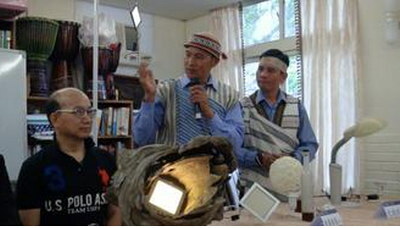 The researchers are devoted to develop blue-hazard-free OLED, such as the orange OLEDs produced by WiseChip and installed in a Taiwanese village last year.